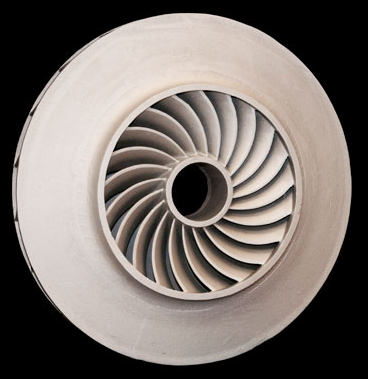 A blower machine builder approached Meloon Foundries to no-bake mold aluminum impellers. The 356T6 aluminum impellers, were to be used in blowers that created high volume, low-pressure air. They were molded on a continuous no-bake mixing production line. Process utilizes shell coring, parts being thoroughly shot blasted to aid in final inspection. Outside diameter is 39″ with .140″ vanes. Controlling important process variables allow impellers to be easily balanced. Product Description This aluminum impeller is used in a blower that creates high volume low pressure air. Overall Part Dimensions O.D. : Ø39"